Well, someone has to be No. 1, so why not the horse with the most impressive maiden victory I saw last year and the most impressive stakes victory I’ve seen this year. I just needed to see if he would rate going two turns after being surprisingly rank in last, and he did, even if it was on the lead. After his last start, Motion said he too “was surprised” he was so rank because he’s actually pretty laid back, and thought, “maybe it was just being his second race with a long time between starts.” I still believe he’ll rate off the pace when conditions warrant it. There was no speed in the Holy Bull and it looks as if he just wound up there, being sharp and much the best, and it was basically all over after he was allowed to get an opening quarter in :24. He just poured it on from there with :23 3/5, :23 4/5, and :24 2/5 quarters and a rapid final sixteenth in :06 flat. He has come home in fast fractions in all his starts, and that is so important. He was always on cruise control, but did run a bit greenly in the stretch, as Rosario had to throw a cross on him and help him change leads. After drifting a little, with his head a bit high, he leveled off nicely and was striding out beautifully at the wire, galloping out strongly. It must be noted he is a May 2 foal, with his birthday falling four days before the Kentucky Derby, so he still has a lot of room for improvement. He looked a picture before the race; not a drop of sweat and perfectly composed, and was still high energy coming back after the race. He’s just a gorgeous horse to look at, both in the post parade and in action. The key may have been Motion running him here against the champ instead of sticking to his original plan of running in the Sam F. Davis Stakes. That’s confidence. He’s bred to run all day, and just looks like a top-class colt. But I still would like to see him rate behind horses and explode like he did in his maiden race to complete the package. Don’t want him getting in the habit of going to the front when you know he doesn’t have to. He has a chance to go after the top spot when he debuts this week in the Sam F. Davis Stakes (G3). A huge effort over that track could bump him up, especially being undefeated like Irish War Cry. I’ll be featuring some Thoro-Graph analysis this week, and as impressive as he’s looked in his three Churchill Downs victories, his speed figures suggest he needs to improve several points after pairing up only fair numbers in his last two races. From a Thoro-Graph standpoint, I’d like to see him improve at least 2 to 3 points off his last two. He seems to have a lot of improvement in him, as his pedigree suggests. We know he has an excellent turn of foot, and it’s all about what kind of transition he makes from 2 to 3. He’s been progressing in the morning, with a 5-furlong breeze in 1:01 at Palm Meadows, followed by a half-mile breeze in :49 3/5. Wilkes has had success using Tampa Bay to prep a 3-year-old, and he should get a test in Sam F. Davis, which has drawn much better fields in recent years and where he’ll face No Dozing, who has been unlucky with wide trips and is training brilliantly over the track. Also, Fact finding and Wild Shot look to be legitimate contenders. If McCraken can demonstrate the same turn of foot he displayed at Churchill Downs and continue his unbeaten streak, he will make his case as the leading Derby contender. Even a very good second will serve him well and help move him forward. He continues to show excellent progress training over the deeper surface at Payson Park, where he breezed 5 furlongs in a bullet 1:02 2/5 for the grade 3 Gotham Stakes March 4. The inner track stakes have not had much of a success rate, but it should set him up well for the Wood Memorial. Looking at his Thoro-Graph figures from last year, he has shown noticeable improvement with each start and his Remsen Stakes number puts him just about where he needs to be to rank among the fastest 3-year-olds. He has left plenty of room for improvement, has an impressive mile and an eighth victory under him already, and Dutrow just has to make sure he has him sharp for his return, as a nine-furlong race at 2 can dull a horse, especially when you go three-quarters in 1:14 and a mile in 1:38 4/5. I would love to have seen him with three preps, starting off in a sprint, but more on that below. His maiden score last year was right up there with Irish War Cry’s as most impressive, so perhaps that trend will continue. He appears to have a ton of class, along with a smooth, efficient stride, and the right running style. Although Dutrow doesn’t have much experience on the Derby trail, he is a terrific trainer who knows his horses as well as anyone. Remains sharp, breezing 5 furlongs in 1:00 1/5, second fastest of 90 works at the distance. Baffert, as he usually does with two top 3-year-olds, likely will send either Mastery or American Anthem to Oaklawn for the Rebel and point the other for the San Felipe, and rather than ship twice, he will run the Rebel starter in the Santa Anita Derby and the San Felipe starter in the Arkansas Derby. Mastery is a colt who appears to have a good deal of raw talent, but will be in limbo until mid-March, so we really won’t have any idea how good this horse is until then and where he fits on the Derby trail, as he has not faced any quality competition, despite winning a grade 1 and grade 3 stakes and romping by 7 1/4 lengths in the Los Alamitos Futurity, in which a maiden finished second. But that maiden did come back to run second in the Robert Lewis Stakes. He appears to have beautiful action and a long, fluid stride, and has the look of a distance horse, so we’ll just have to sit and wait until March, as we did with American Pharoah two years ago. He turned in a bullet half-mile breeze in :48 flat at Palm Meadows, fastest of 30 works at the distance and followed that up with a half-mile breeze in :49. I’m really looking forward to seeing him get a true shot at a two-turn race, feeling he was at a disadvantage in the Breeders’ Cup Juvenile, regressing slightly off his gut-wrencher in the Champagne Stakes. He’s on an excellent Thoro-Graph pattern, running fast figures in his first two career starts, jumping up three points in the Champagne to put him right up there with the fastest 2-year-olds, and then bouncing just slightly in the BC Juvenile, in which he didn’t have the cleanest of trips, losing some momentum on two occasions, especially when Not This Time came in and forced him to alter course at the three-sixteenths pole. I’m not sure how far he wants to go, with several speed influences in his pedigree, and that is why his 3-year-old debut is so important. We do know he’s as steady as they come and has proven his courage under fire. The Champagne also received a boost when the well-beaten third-place finisher, stablemate Favorable Outcome, rallied to win Saturday’s seven-furlong Swale Stakes. There was nothing not to like about his second-place finish in the Holy Bull Stakes. He was pretty much up against it once Irish War Cry got an uncontested lead in :24, and he had to keep up down on the inside, while racing closer to the pace than usual. Despite having to steady nearing the quarter pole while trying to come through on the rail, he still closed with good energy, finishing well clear of Classic Empire, and was running on strongly through a very fast final sixteenth. The short stretch didn’t help him either, and it was obvious that he needed more ground and will be more effective with a contentious pace and a longer run to the wire. Despite selling for a bargain basement $16,000 as a yearling at Keeneland, he has a pedigree inundated with class and stamina on top and bottom. His third dam, Minstrel Princess, a son of English and Irish Derby winner The Minstrel, is a half-brother to Lucy’s Axe, winner of the Rebel Stakes and second in the Peter Pan and Remsen Stakes. But it is names like grandsires Mineshaft and Unbridled and great-grandsires A.P. Indy, Storm Cat. Fappiano, and Graustark, not to mention Ribot, Le Fabuleux, The Minstrel, Seattle Slew, and inbreeding to Secretariat and Mr. Prospector that makes this such an outstanding pedigree. We know Gunnevera has an explosive turn of foot going two turns and the speed to win a grade 2 sprint stakes at Saratoga. It’s just a question whether he’s fast enough, if you go by his Beyers. But he did jump up nearly six points on Thoro-Graph in the Delta Jackpot to put himself right there with the top contenders. And you had to love the explosive move he made on the turn at Delta, inhaling the leaders and drawing off to win by nearly 6 lengths. The Holy Bull was extremely disappointing. It wasn’t that he finished a lackluster third at 1-2, beaten nearly 9 lengths. Any one race can be forgiven. It’s a question of whether he can be trusted as a horse who will be able to handle the Derby mayhem. This time it was a fretful van ride the morning of the race that did him in. Casse said the colt fretted very badly on the van ride from Palm Meadows. Because it was the first time he’s ever vanned to a track on race day he is done with Gulfstream and will ship to a racetrack out of town for his next prep that is still to be determined and will train up to the race there. We all were convinced his meltdown at the start of the Hopeful Stakes was an aberration and that blinkers and maturity had cured him of any flighty behavior, especially with the professionalism he showed in his final two starts. But when he sweated up badly going to the post in the Holy Bull and got progressively worse by the time he got to the gate, where he became noticeably agitated, that sent up major warning signs. Then to come up as empty as he did was cause for concern. Casse was happy with the way he’d been training, but it must be noted he had only four works at Palm Meadows, including a final 5-furlong work in company in 1:03 4/5. He still is the champ and capable of bouncing back, as we’ve seen in the past, and this wasn’t nearly as alarming as what he did in the Hopeful. But as I mentioned, can we trust him at Churchill Downs to be as calm and collected as he will need to be and not do anything to severely hurt his chances? And we saw Saturday how fretting and sweating can affect his performance. Casse said he handled the crowd at the Breeders’ Cup fine. Frankly, I have no idea what to expect from him. I still feel he is immensely talented, as he demonstrated last year, but his unpredictability has to be a concern regarding the Derby. His next race will be very important. He is another who is on an excellent Thoro-Graph pattern, and I love the kind of improvement he’s made since starting off his career with a very solid figure, much like Practical Joke. One of the reasons for his excellent Thoro-Graph numbers is the ground loss he’s suffered. He continues to train sharply, breezing 5f in 1:01 1/5 at Tampa Bay. The reason his Beyer figures are slow is that it doesn’t take ground loss into consideration. We’ll see if he can use his home track advantage to knock off leading Derby contender McCraken in Saturday’s Sam F. Davis Stakes. It should be interesting to see what he can do with a decent trip for a change. We know he has a good turn of foot, an excellent middle move, and can motor around the turn. He always puts in a good run. He’s been able to sustain his move, but just not quite strong enough to seriously threaten the winner, and that most likely is due to the ground loss and the fact he’s lost to Classic empire and Mo Town. We know he has sprint speed, winning his first two career starts impressively at Delaware Park and Laurel. Right now, we just want to see what he’s capable of with a good trip and a well-timed move. He continues to train sharply, breezing 5 furlongs in a bullet 1:00 3/5 at Oaklawn, fastest of 55 works at the distance, as he prepares for the Southwest Stakes. As impressive as he was in the Smarty Jones Stakes, I believe he’s going to improve a great deal off that effort, as indicated by his Thoro-Graph jump, in which he still left a lot of room to move forward. As mentioned, it was impressive the way he took control of the Smarty Jones and left a lot in the tank at the end. He just looks like a natural runner who can bound along and carry his speed a long way. And his pedigree would seem to validate that, with all the class and stamina influences close up and a number of horses who proved to be extremely durable. It is said his mile time of 1:36 1/5 in the Smarty Jones was the fastest since they began running the distance in 1988, which resulted in a whopping 96 beyer figure. He’s a laid back horse who always looks like he’s running much slower than he actually is, and that bodes well for his ability to rate behind horses. We just need to see it. You would rather see him use his speed tactically if he’s going to fit the profile of a Kentucky Derby winner, as front-running Derby winners are very rare. He still has several preps to learn to settle off the pace, but you also don’t want to take a free-running horse like this out of his comfort zone if this is the way he wants to run. It will just make things more difficult on the first Saturday in May. If he can harness some of his speed there’s no telling how good he may be. Shirreffs gave him a nice easy half-mile breeze in :49 3/5, as he prepares for a likely start in the March 11 San Felipe Stakes, where he will tackle either Mastery or American Anthem from the Bob Baffert barn. Right now, these three, along with his stablemate Royal Mo, appear to be the standouts among the Southern California group, which is not very deep this year. It looks to be Shirreffs’ pair vs. Baffert’s pair, but it is still early. Doug O’Neill may have a decent pair as well. There are several who might be lurking in the wings, but we’ll just have to wait until the San Felipe to see if he can continue to rate off the pace and continue to stretch out in distance. The Sham was a big bounce back effort after the Breeders’ Cup Juvenile and showed his tour-de-force in the grade I FrontRunner Stakes was no fluke. Despite his natural speed, there is a ton of stamina in his female family. I don’t know if Baffert is trying to slow him down and curtail his speed, but his 5-furlong breeze in 1:02 3/5 is not your typical Baffert work. Although he’s had only two lifetime starts, his Thoro-Graph numbers are impressive, while still leaving room for improvement. As mentioned earlier, he likely will run next in either the San Felipe Stakes or Rebel Stakes. He is another who needs to harness some of that early speed, especially having had only the two career starts. He is on schedule to have only two more Derby preps, which means he’d be going to Louisville with only four career starts, and history is against horses with so few races, especially one who, at this point, has been one dimensional. His sire nearly pulled it off with only four career starts, but it remains to be seen if American Anthem is anywhere near as gifted as Bodemeister, whose Arkansas Derby romp was as brilliant and dominating a Derby prep as we’ve seen in years. He’s on quite a roll, winning his last four starts in impressive fashion, and there is no faulting his handy score in the Withers Stakes, in which he again manhandled the local horses, who proved no match for him. But it must be noted that runner-up True Timber finished 7 1/2 lengths closer to him than he did in the Jerome. Part of that can be attributed to the improvement of True Timber, who is bred to be more of a late developing distance horse, and is in the capable hands of Kiaran McLaughlin. But for now, El Areeb has been a dominant force in New York. We’ll have to see how he fares against better company when the pace will be faster than 1:14 and 1:38 1/5. And as mentioned several times already, Exchange Rate will have to prove he can sire a horse who can win major stakes at 1 1/4 miles, although El Areeb’s female family is loaded with top-class Canadian distance horses, as reported last week. Whether he’s a Derby-type horse or not, there is no doubt he is a talented colt who any trainer would love to have in his barn. I hated having to take GUEST SUITE off the Top 12, but with El Areeb winning so convincingly and Irish War Cry bursting on the scene, there simply was no room for him. But that doesn’t mean he still isn’t one of the leading Derby contenders, and he’ll have plenty of opportunities to get back on the list. He breezed a solid half this week in :48 4/5. There also wasn’t any room to fit in the Robert Lewis Stakes winner ROYAL MO, which would have given John Shirreffs two horses in the Dozen. As good as Royal Mo looked, the Lewis was a weak field, so we really have no gauge to tell us just how good he is. I will say this, from a purely physical and visual standpoint he looks like a horse loaded with class, who has a commanding presence, a beautiful, elegant head, and a smooth, fluid stride that made him stand out from the others. There is also a good deal of American stamina and English blood in his female family to go with his sire Uncle Mo. Having two horses on the Derby trail trained by John Shirreffs who are both frontrunners is pretty unusual to say the least. It’s too early to tell just how good this horse is, but he is one handsome individual who is only going to get better. Shirreffs said he’s still a boy who’s a little bit on the shy side, but he’s definitely eligible to improve. Speaking of Santa Anita and the Lewis field, whether it’s been the weather setting many horses back or the Santa Anita-based 3-year-olds simply are thin this year, it was disappointing seeing a major prep like the Lewis come up with only five entries, none of whom had showed much. Two were coming out of unspectacular maiden victories, one was a maiden, despite finishing a distant second to Mastery in the Los Alamitos Futurity, one was coming off a 17 1/2-length defeat in the Sham Stakes, and one was beaten 13 lengths in the Los Alamitos Futurity and 9 3/4 lengths in the Delta Jackpot in his last two starts. On top of all that, Bob Baffert scratched his talented colt BIG GRAY ROCKET, fourth in the Champagne Stakes, from a one-mile second level allowance race last Thursday, and then a 1 1/16-mile maiden race on Saturday drew only six horses. But Baffert did unveil another possible Derby contender in that maiden race in REACH THE WORLD, a Tapit colt making his second start who led all the way to win by 3 1/4 lengths. His time of 1:44 2/5 was a full second slower than the time of the Lewis. Reach the World was coming off a third-place finish behind DABSTER, another Baffert colt, who won in a four-horse blanket finish. In January of 2016 I wrote a column about something I felt strongly about. Well, I still feel strongly about it and am reprinting a few graphs from it to get the point across again. See how long it takes you to answer this question. Going back to the 1960s and 1970s, and even the majority of the 1980s, what do these 2-year-old and 3-year-old champions and classic winners have in common? In the 1970s, Triple Crown winners Secretariat, Seattle Slew, and Affirmed, Spectacular Bid, Riva Ridge, Foolish Pleasure, Hoist the Flag, Little Current, Key to the Mint, Honest Pleasure, Bold Forbes, Rockhill Native, and we’ll include Alydar on the list. In the 1960s, Damascus, Buckpasser, Arts and Letters, Majestic Prince, Kelso, Northern Dancer, Bold Lad, Top Knight, Chateaugay, Successor, and Vitriolic. And we’ll add in the 1980s, Easy Goer, Sunday Silence, Swale, Spend a Buck, Devil’s Bag, Chief’s Crown, Conquistador Cielo, Forty Niner, Gulch, and Plugged Nickle. You will agree that many of these are all-time greats. Well, the answer is every one of these horses made their 3-year-old debut in a sprint race. A total of 19 of them were in allowance races, and the rest were in the Hutcheson, Bahamas, Bay Shore, Swale, Swift, Hibiscus, Los Feliz, San Miguel, and Key West Stakes. The only problem is, no sprint stakes are awarded any Derby points, forcing many trainers to just ignore these all-important races that, as the great horsemen from the past would tell you, get horses sharp before stretching back out to distance races. Continuous two-turn racing at 2 and 3 can dull a horse, and they need to be sharp in the Kentucky Derby, where early positioning is so important, as is tactical speed. As if on cue, Nyquist and Exaggerator went on to debut in the seven-furlong San Vicente Stakes, finishing one-two, respectively, and then finished one-two again in the Kentucky Derby and then one-three in the Preakness, with Exaggerator reversing the order of finish. So, did trainers learn from all this? Hardly. This year the seven-furlong Hutcheson Stakes didn’t even fill and the seven-furlong Swale Stakes drew only six horses, with the only major stakes horse from last year being the Champagne Stakes third-place finisher FAVORABLE OUTCOME, and we’ll throw in THREE RULES, even though his big wins were in the Florida Stallion stakes and he did compete in the Breeders’ Cup Juvenile, tiring after going four-wide into the first turn. These two horses finished one-two in the Swale, with the victorious Favorable Outcome being the one horse in the field who looks as if he could be Derby material. Of course we don’t know how far he wants to go, having a sort of an offbeat female family. But he is grade 1-placed behind two very talented colts, was nothing more than an experiment, being thrown to the wolves in the Breeders’ Cup Juvenile Turf, and was fast enough to win his debut by 6 lengths in 1:09 4/5 at Saratoga. If he does want to go long, the Swale could prove an excellent starting off point, as it did for Nyquist and Exaggerator last year. But at this point it looks as if Chad Brown is going to keep him one turn. Three Rules is a talented horse, but he has to show he can come home going two turns against quality competition. We'll see if he can stretch out effectively off the Swale. 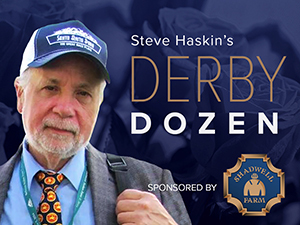 The bottom line is, if you have a major stakes-winning 2-year-old who has earned points or you feel you have a serious Derby contender, you don’t really need to be chasing points in early February, with two big preps still on your schedule. I realize this is old school thinking, but there is something to that list of sensational horses mentioned above. We don’t know yet who will be in next Sunday’s San Vicente, but you might want to keep an eye on ILIAD, who doesn’t fit the above profile, having only run in two sprints and breaking his maiden impressively in a blistering 1:08 1/5. But his pedigree suggests he should be able to stretch out in distance, so we’ll see what we’re dealing with next week. We know he’s sitting on a big race after working a half in a bullet :47 3/5, fastest of 71 works at the distance. If there is a filly who looks like she’d be a good fit on the Derby trail, it is UNIQUE BELLA, especially considering there are no real standouts at this time in Southern California. The daughter of Tapit looks more and more like the proverbial freak, but unlike her fellow freak, Songbird, she has great tactical speed, can sit back off the pace, and can explode whenever jockey Mike Smith pulls the trigger. The way she won the Las Virgenes Stakes under wraps after powering away from her foes with ridiculous ease, there is no telling just what she is capable of. But she hasn’t been farther than a mile, is still lightly raced, and trainer Jerry Hollendorfer said there are no plans to run her against the boys, despite her being nominated to the Triple Crown. Her owner, Don Alberto, also owns Saturday’s maiden winner Reach the World. Can anyone remember a trainer having two such brilliant young fillies in the barn at the same time? One race that drew a good deal of attention was the two-turn debut of the exciting maiden winner BATTALION RUNNER, who had a good chance of jumping into the Top 12 with a repeat performance. While the son of Unbridled’s Song looked good in his workmanlike victory over BEASLEY, it’s still a bit too early to rank him among the proven stakes horses. Both colts ran very gamely, as they drew well clear of third-place finisher PAINTER’S RAGS, with Beasley giving up ground grudgingly after setting a relatively soft pace. It wasn’t until the last few yards that Battalion Runner began to assert himself and inch away to a 1 1/4-length score. He then jumped over to his left lead just as he crossed the wire. Both colts look to have bright futures, and we’ll definitely know more about Battalion Runner when he steps up in class, likely in the Fountain of Youth Stakes. In addition to Battalion Runner and the rest of his army of 3-year-olds, Pletcher also has a colt with great promise in ONE LINER, who is way behind, breaking his maiden first time out last July, and then off a 6-month layoff, won a six-furlong allowance race by 2 1/2 lengths in 1:10 flat. Distance is a question mark, but he looked very impressive the way he moves over the track. As if Pletcher needs any more 3-year-olds, Saturday’s activity began at Gulfstream with the newly blinkered HEDGE FUND breaking his maiden with authority in his two-turn debut after being hustled out of the gate from the outside, stalking the pace, and drawing away on his own. The son of Super Saver is just another in the long list of Pletcher-trained 3-year-olds to dominate racing at Gulfstream. The undefeated Pletcher colt FACT FINDING, who scratched out of the Holy Bull to run next week in the Sam F. Davis Stakes, breezed a half in :50 2/5 at Palm Beach Downs. Last year’s game Champagne runner-up SYNDERGAARD returned to the work tab, breezing 3 furlongs in :38 4/5 at the Stonestreet training center. The speedy MALAGACY, runaway winner of his debut at 5 1/2 furlongs, breezed a bullet half in :48 flat, fastest of 14 works at the distance. Last week, we reported on the amazing maiden victory at Oaklawn by HENCE. Well, the horse who allowed him to come back and beat him, HORSE FLY, was in action again, breaking his maiden by a nose in slow time for Wayne Lukas. Hence, meanwhile, was on the work tab, breezing 5 furlongs in 1:02 2/5. Normally, no one takes the Golden Gate preps too seriously, as they are run over the Tapeta surface and rarely produce a serious Derby contender. But it looks as if Paul Reddam and Doug O’Neill might have a live one in California Derby winner SO CONFLATED, who has shown good dirt form and was a solid third behind American Anthem in his career debut. In the California Derby, he settled well along the inside under a nice long rein, but when they turned for home, he ran into a wall of horses while in tight quarters, and, after taking a solid bump from the horse outside him, had to keep easing to the outside looking for room. When he finally found clear sailing, he rallied, but switched back to his left lead when the jock tried to angle him farther out. He closed in on the leaders and switched back to his right lead before drawing clear at the finish. This week at Santa Anita, he tore up the track with a bullet half-mile work in :46 4/5, fastest of 68 works at the distance. By Eskendereya, his broodmare sire, Tiger Ridge, is a half-brother to A.P. Indy and Summer Squall, and his third dam is a half-sister to Lady’s Secret. He is also inbred to Triple Crown winners Secretariat and Seattle Slew. In other works of interest, Kentucky Jockey Club Stakes runner-up WILD SHOT, breezed a quick 5 furlongs in 1:01 at Payson Park for Saturday’s Sam F. Davis Stakes. The fast-closing Breeders’ Futurity runner-up and BC Juvenile fourth-place finisher LOOKIN AT LEE, turned in a solid 5-furlong breeze in 1:01 flat at Fair Grounds for his likely debut in the Risen Star Stakes. STATE OF HONOR, who was beaten a head in the Mucho Macho Man Stakes in his dirt debut, breezed a bullet half in :47 flat at Palm Meadows, fastest of 28 works at the distance.. PETROV, second to Uncontested in the Smarty Jones, continues to work well, breezing a half in :48 1/5 at Oaklawn for the Southwest Stakes, with clockers getting his final quarter in a snappy :22 3/5, going out a strong 5 panels in 1:00 2/5. This could be a real dark horse for the Oaklawn Derby preps if there is enough pace to keep Uncontested busy. Following their 1-2 finish in a one-mile allowance race at Oaklawn, CHIEF KNOW IT ALL and runner-up JERRID appear ready to move up to stakes competition in the Southwest Stakes, although Jerrid, with only two lifetime starts, more likely will be targeted for an allowance race two days earlier on February 18, according to trainer Scott Young. ROWDY WARRIOR, who breezed 5 furlongs in 1:01 is another who could go in the Southwest or the allowance race. Although he’s still a maiden, Donegal Racing’s ARKLOW could be one to watch in the Risen Star Stakes after his fast-closing fourth in the LeComte Stakes, beaten only 1 3/4 lengths by Guest Suite. Also scheduled to face Guest Suite in the Risen Star is TAKEOFF, a strong third in the LeComte, who breezed 5 furlongs in a sharp 1:01, and LeComte runner-up UNTRAPPED, who breezed 5 furlongs in 1:02 2/5.